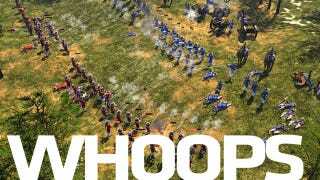 Fans of genre-defining real-time strategy game Age of Empires likely won't be surprised to learn that the father of the series wasn't a big fan of third game. "With Age of Empires 3 we tried all of these new ideas," said Bruce Shelley, founder of Age of Empires creators Ensemble Studios. "I think it was a huge mistake." "We wanted to create something that was 30 percent the same, 30 percent borrowed and 30 percent innovative. I think we tried to do too much." Shelley said that when they decided they had gone too far and tried to rebuild the game as a classic Age of Empires title it was too late. "It was like being a child changing all of the dials on a television and then trying to get that picture back," he said. "It just wasn't an Age game anymore." Shelley and his team were so aware of the changes and their inability to return the game to the folds of the series that they wanted to change its name from something other than Age of Empires, but Microsoft, he said, wouldn't allow it. Shelley now works with Zynga, a developer that created the game he played the most last year. "Last year the game that really affected me was Frontierville... this is a real game, this is serious and this really opened my eyes about the potential that could happen here," he said. He says the game was very different from Farmville, a game that he described as pretty simple. Now, with his work at Zynga, he is working with an external studio on a game. Zynga gets it, he said. "We want more people from the Sid Meier school of iterative game design," he said. "I think it has been a learning experience for (Zynga)."